The hyped anticipation surrounding the Apple Event later this week is looking for clues as to exactly what the company might deliver. One element of the anticipated new tablet's software side is related to Apple's 2005 acquisition of multitouch technology and expertise from FingerWorks. This article features the evolution of the software side of tablets and technology related to multitouch interfaces. 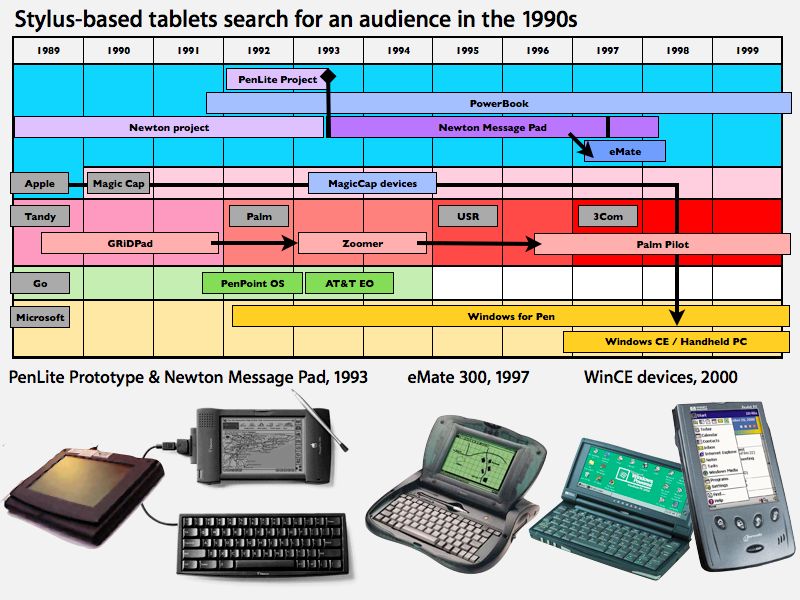 The hardware side of historical tablet products was profiled earlier in The inside track on Apple's tablet: a history of tablet computing. The infusion of technology developed by FingerWorks meshed with research Apple had already been working on in the area of touch-based interfaces as an alternative to the keyboard. Since the origins of the personal computer in the mid 1970s, the conventional keyboard has always been its primary interface. But investigation into alternative finger touch methods of computer input was in progress at least as early as 1982, when Nimish Mehta at the University of Toronto published research involving cameras, placed behind a translucent panel, that could record multiple touch points of a user's hands. Mice and then trackballs were added to provide pointer-centric navigation within the graphical environment that the Macintosh popularized in the 1980s. Having a keyboard still remained essential in personal computing however, in many cases being more efficient than trying to use an alternative device to point to items in a menu. In the 1990s, the idea of stylus-based "pen computing" questioned whether the keyboard was still absolutely necessary, particularly in mobile devices. Apple's 1993 Newton Message Pad offered an external keyboard accessory, but it was primarily designed to be used via its stylus, using a series of pen gestures and handwriting recognition for text input. Apple also prototyped a PowerBook-based tablet system called the PenLite in 1993, but did not release it to avoid affecting Newton sales. The Newton's advanced ink technology was criticized and mocked for its initial inaccuracy, a problem Apple largely corrected in its Newton 2.0 release. By then however, many were convinced that its ink recognition technology wasn't really feasible. When Palm launched the Pilot in 1996, it used a simplified alphabet system called Graffiti that greatly reduced recognition errors, although it also required learning a new handwritten input system of simplified letter forms. Palm's Graffiti input software had premiered on the Newton, but Apple's PDA platform failed to reach a critical mass in sales. Palm's popular Pilot PDAs powered by Graffiti initially seemed to suggest a rosy future for stylus input as a keyboard alternative. While compact external keyboards were available for it as well, the value of the Palm Pilot's portability came largely from its pen. in 1997, Apple released a new Newton form factor: the eMate, which paired a stylus with a conventional keyboard in a mini-laptop design. The device was aimed at education at a time when schools were unlikely to spring for full-powered, full priced notebooks for every student. Before it had much time to be evaluated by the market however, the entire Newton line was pulled in early 1998 as Apple worked to focus on its most promising platforms in an effort to return to profitability. Microsoft belatedly attempted to deliver its own alternative to Palm's PDAs by morphing its unsuccessful Handheld PC product line (clamshell mini-laptops with keyboards) into stylus-based Palm PC PDAs around 2000 (they were later renamed Pocket PC after Palm objected to the name). The company also attempted to resurrect Newton-style freehand handwriting recognition by licensing technology from Apple spinoff General Magic in 1998. Microsoft licensed its Pocket PC operating system (built on the Windows CE kernel) to a variety of hardware manufacturers over the decade of the 2000s, but the PDA category failed to materialize as a significant market. Since 2001, the company has also marketed a stylus-based tablet version of its desktop Windows platform (based on the Windows NT/XP kernel), which has also been unsuccessful outside of a few niche markets. Bill Gates' 2001 prediction that "within five years [the stylus-drive Tablet PC] will be the most popular form of PC sold in America" simply failed to materialize. On page 2 of 3: Touch takes on the keyboard. Rumor: Apple could announce end of AT&T iPhone exclusivity Wed.